One of the things I like about the signage along the trail is that it always give you distances to the next couple of streets. Conspiciously missing from all of the signage is any mention of distances or routes to major destinations along the path. For example, there’s never any mention of how far the Toronto Zoo is (it’s a lot closer than you think), or that you’re coming up to U of T’s Scarborough Campus, or that you’re riding behind the Scarborough Hospital, or that you’re 300 metres away from my dentist’s office. 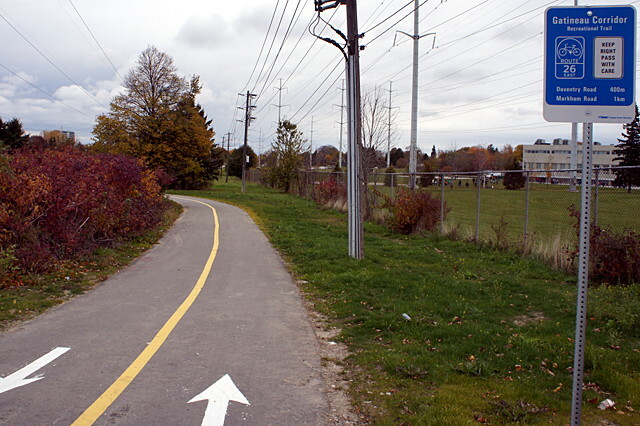 There are signs everywhere in the city directing drivers to the 401 and DVP, but not a single sign pointing cylists to this trail or, once they’re on it, pointing them to other nearby trails or destinations.